Last week, my father’s best friend of 40+ years came to visit Philadelphia with his daughter, Emily, for a whirlwind visit to the region’s top colleges. It’s always so much fun when Pat visits. We eat a lot and drink a lot and my dad is very happy. I saw Pat and Emily, twice during the week. The first night we ate in with a massive amount of Pat’s famous grilled paella (to be blogged at a later date.) On Friday night, however, Emily wanted to visit an authentic Italian-American restaurant. It was immediately a battle between Villa di Roma and Scannicchio’s in my mind, although Scannicchio’s won out for two reasons: proximity to my house and its BYOB status. For some reason, I didn’t think Pat would be a fan of Villa’s jug of house red served in juice glasses, although it’s never bothered me. When in Rome, right? Pun intended. Scannicchio’s it was and no one was disappointed. We first visited it with my parents a couple of years ago for some sort of family birthday or going away celebration. We can’t remember why we were there but everyone had a great time. Pat and Emily got to our house about an hour or so before our reservations. Emily wanted a cup of coffee so I sent my husband and Pat off to the “Fine Wine and Good Spirits” store to pick up some wines for dinner while Emily and I set out in search of caffeine. Although I wanted to take her for a stroll along the avenue, I thought Ultimo Coffee on 15th and Mifflin, which also has the distinction of being attached to Brew, a boutique bottle shop. How cool is that??? I quickly eschewed my plan for peppermint tea and Emily got a chai latte while I settled for a little taste of the past. 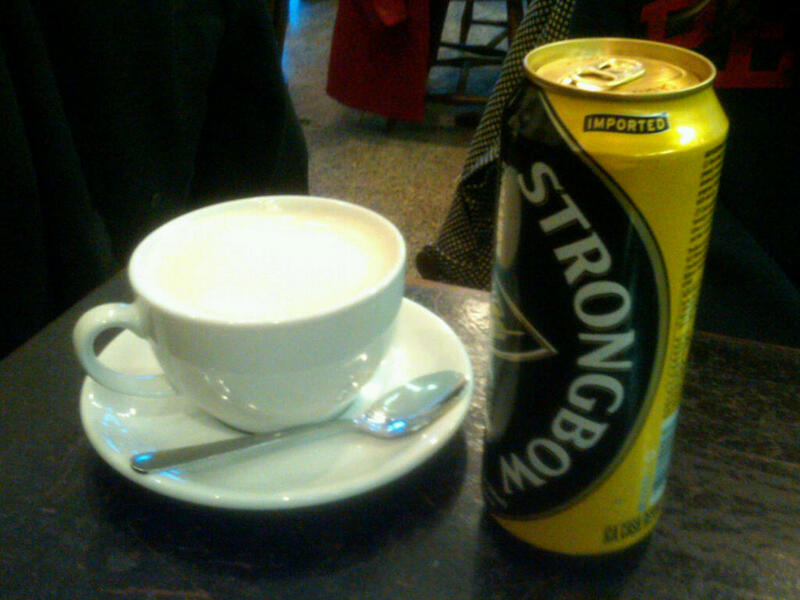 My brother studied abroad in London and we all drank many a canned Strongbow during a chilly December visit. In fact, last time I was at Brew, I requested that they add Strongbow to their offerings so I was pleasantly surprised to see that it was available. Talk about customer service! We arrived at Scannicchio’s just in time for our 6:30pm reservation and were seated by the owner’s friendly fiancee. As they dropped off the complimentary bread and roasted peppers, we opened my first ever rich, raisiny Amarone. Our waiter came over to recite the specials and all of the appetizers sounded fantastic. They had my absolutely favorite arancini (which I pretty much have to get when they’re on a menu) so I was pumped! For appetizers, we ended up with two orders of the aranicini (they called them rice balls) and sausage and figs for the table while Emily got a salad of mixed greens and Pat got the special grilled romaine heart with strawberries. 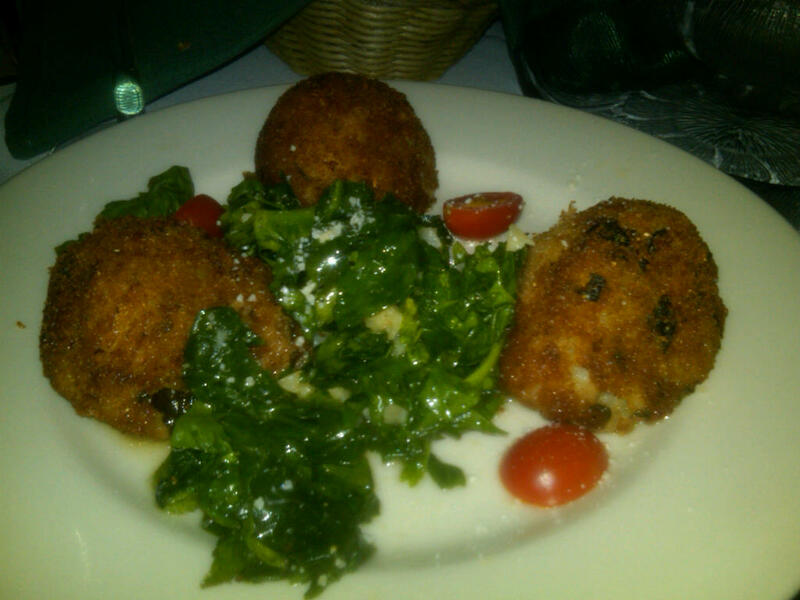 The arancini were, not surprisingly, amazing. They were crunchy on the outside and soft, cheesy and gooey on the inside. As an added bonus, they came with a small serving of greens as well. While each order only had three balls, each one was pretty sizable, making sharing an option–not like you’d want to share this bite of deliciousness. 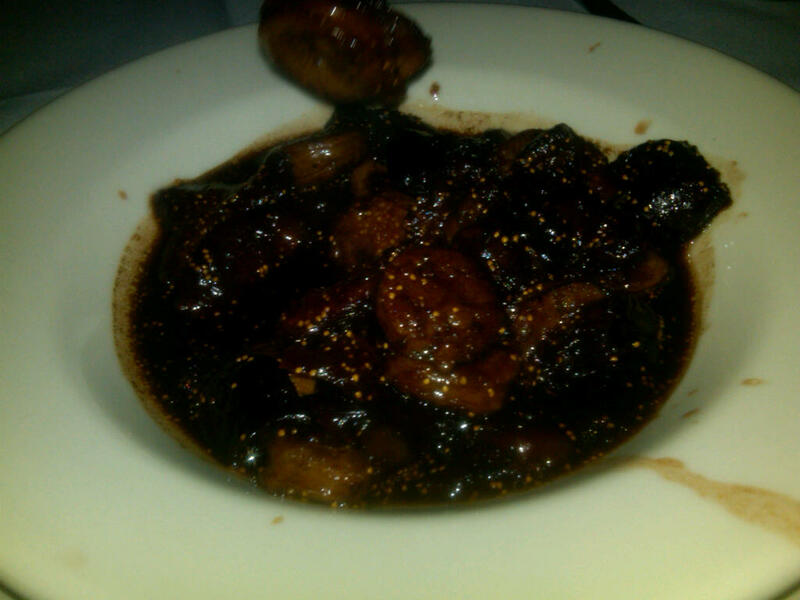 The sausage and figs was a surpringly good combination, although the darkness of the dish makes for a terrible picture. It was very sweet but the soft figs and chewy sausage provided a great textural combination along with a kick of syrupy balsamic. I would have liked for the dish to have a little more sausage though, as it seemed to be a bit fig heavy. 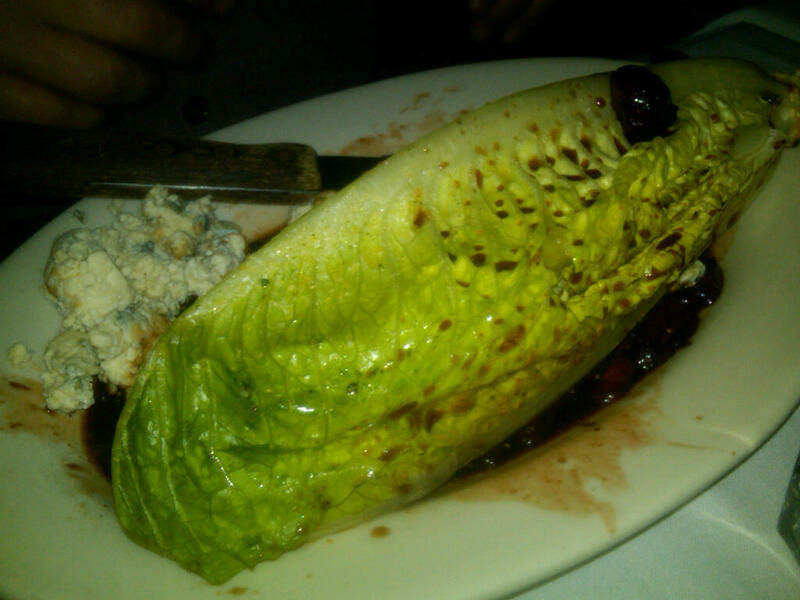 Pat’s salad could have easily been split between a few people as the romaine heart was generous. Pat believes it was grilled with the outer layer of leaves were removed in order to maintain the smoky grill flavor without the char of the leaves. The strawberry dressing and blue cheese were a perfect marriage for the crisp, clean bite of the romaine. What a refreshing dish. We opened up another bottle of wine as the entrees came out. I didn’t really taste many of the entrees as I was busy focusing on my heart attack on a plate. 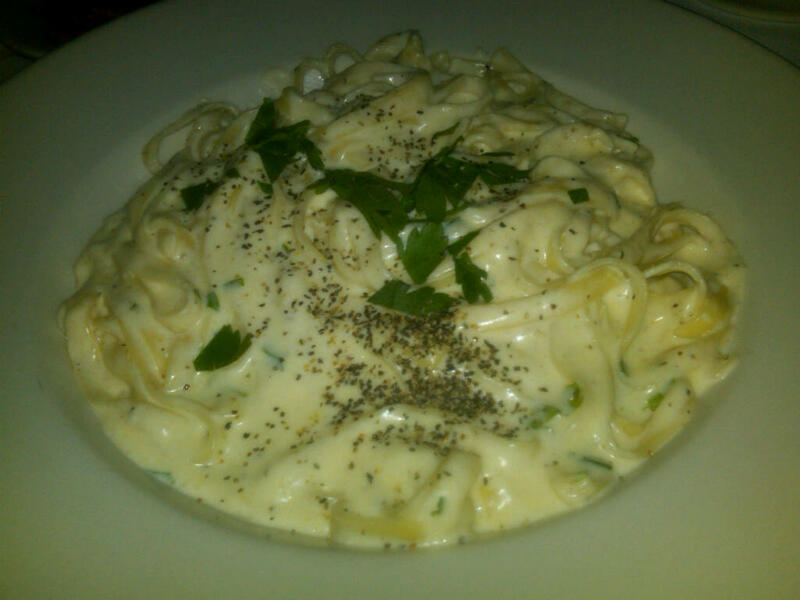 I love fettucine alfredo. As much as I enjoy trying different things, I can be counted on to get fettucine alfredo at just about any Italian restaurant (Marra’s, Villa di Roma and Ralph’s come to mind.) In my very unofficial search for the best fettucine alfredo in Philadelphia, Scannicchio’s is officially leading the way. The sauce was thick, flavorful and creamy. All it required was a quick twist of the pepper grinder and some parmesan for the added texture and it was perfetto! Look at that thick, white sauce! The fact that I got two meals worth of food for $14.95 doesn’t hurt either. It was around this time that they noticed me taking pictures and said “I hope you’re going to put them on the internet!” I assured them that I would. I only tried two of the other entrees. 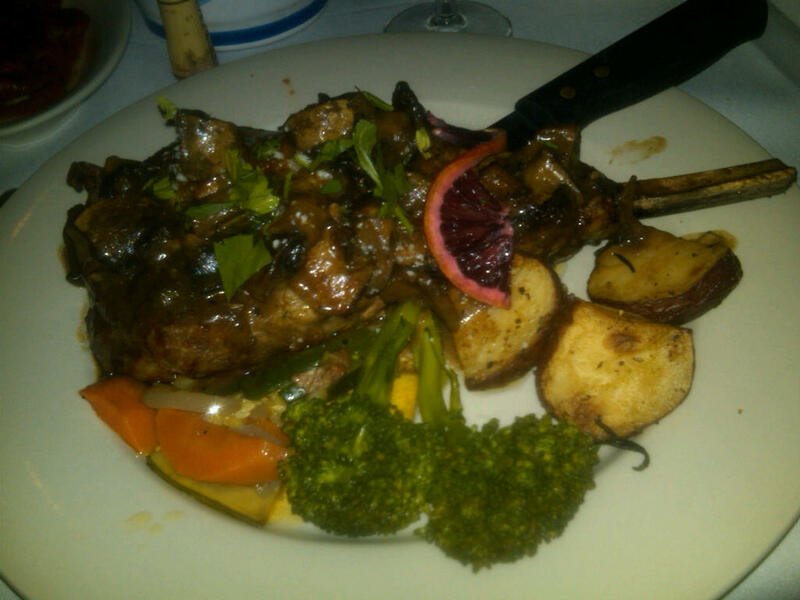 My mom’s pork chop and Emily’s veal chop special. The pork chop was incredibly moist and chock full of flavor. My husband’s white fish special. 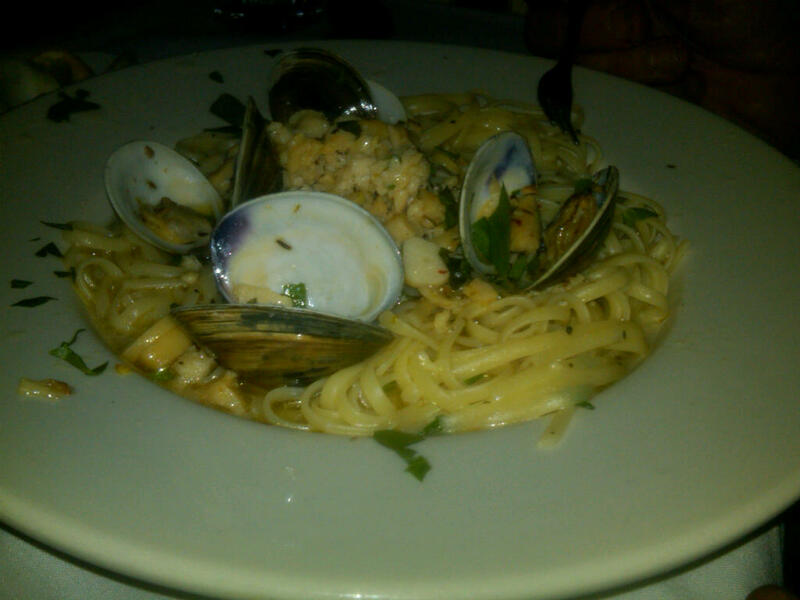 My father and Pat both got clams with white sauce. One of them had fettucine and the other had linguine. About halfway through they realized they were eating the other’s dish. Whoops. 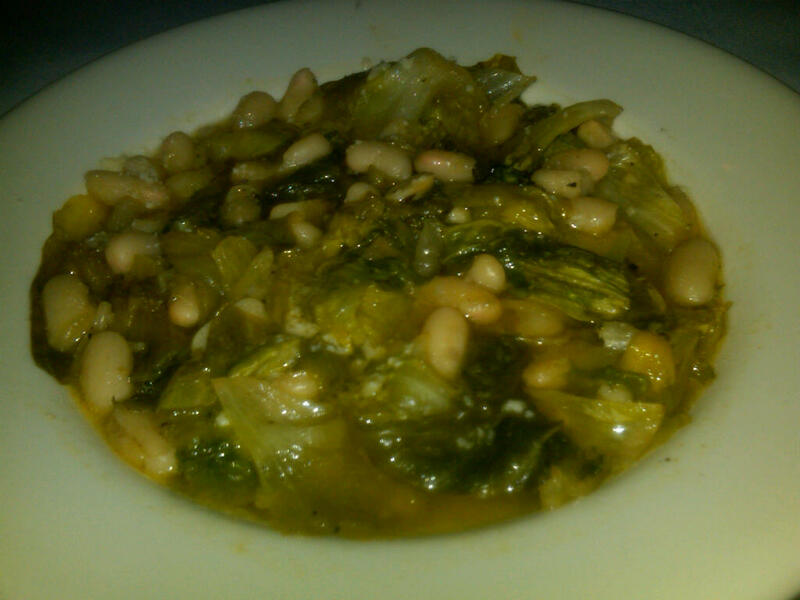 My dad got a side of escarole with white beans. 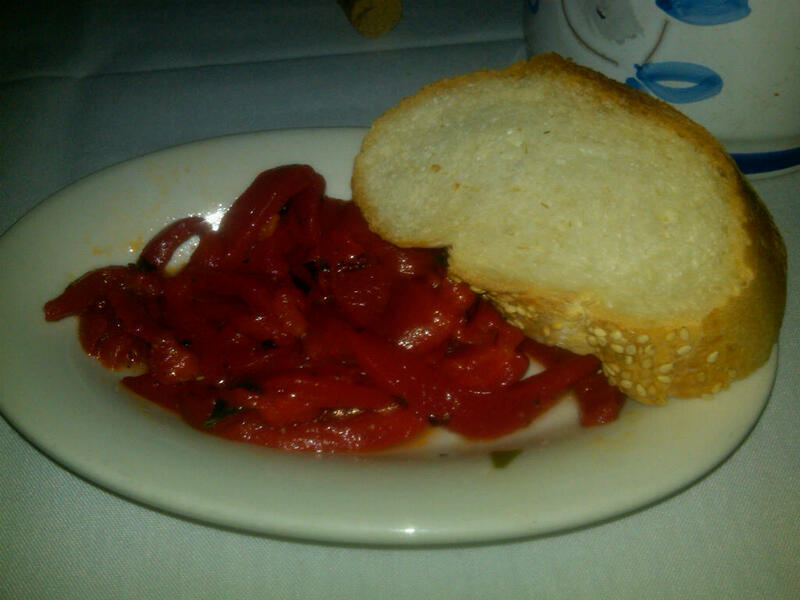 I didn’t eat too much because my dish was more than enough, but the few bites I had were homestyle Italian perfection in the brothy dish. 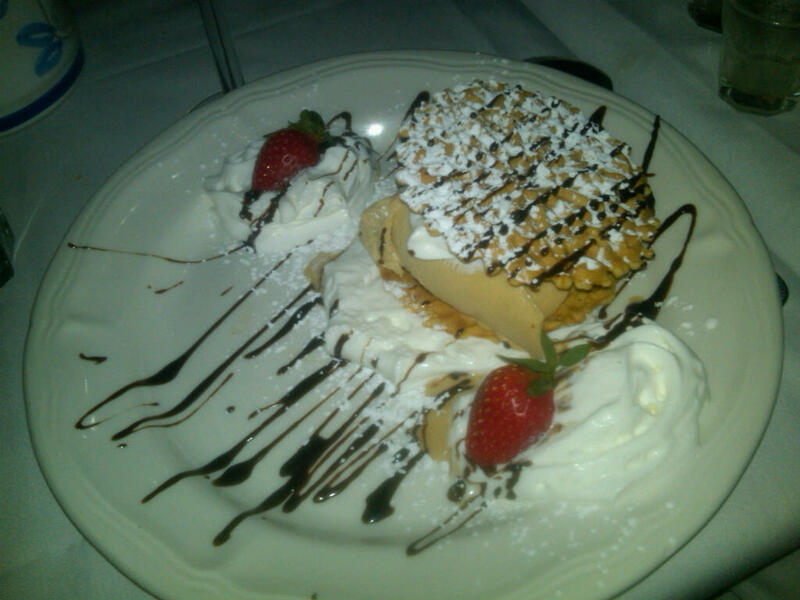 Last up was dessert. We had no need for dessert with the amount of food we had just consumed, yet everyone wanted to hear the options. 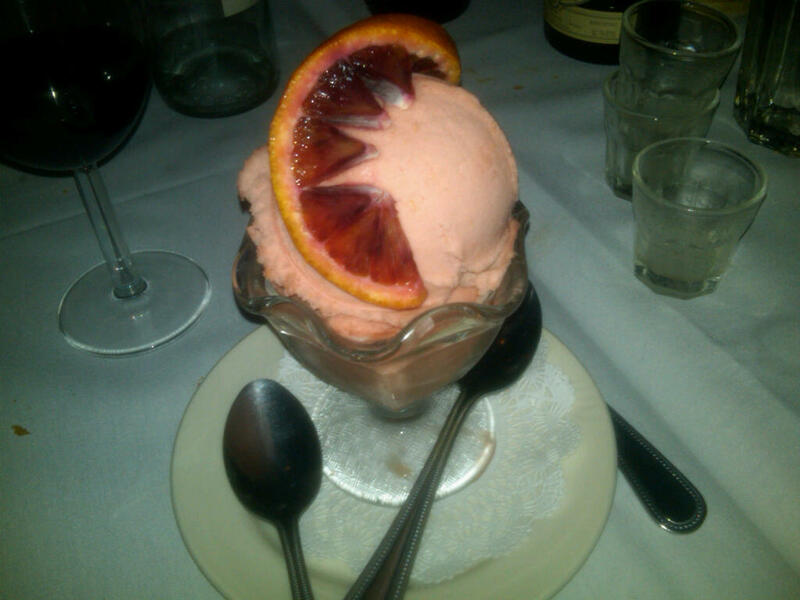 We ended up with three orders of blood orange sorbet (or was it gelato? ), some other fruity gelato–maybe dried cherry and some crazy dessert of nutella ice cream sandwiched by two pizzelles for my mom. Oh whoops, did I forget to take a picture of the complimentary pina colada-cello that came with dessert? I guess we enjoyed them a little too quickly for that! 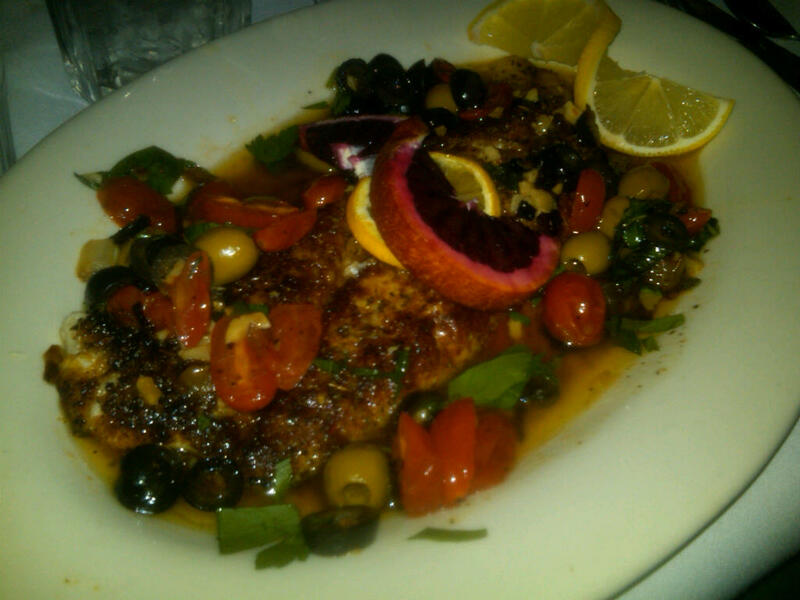 Overall, Scannicchio’s is an amazing place to go with a group of hungry friends or family. While we enjoyed nicer libations, a group walked in with a cooler of Miller Lite and boxed wine as we were finishing up and they were welcomed just the same. Scannicchio’s welcomes all sorts of diners with open arms.